Offering porter services has allowed one company to play point for its commercial maintenance accounts. 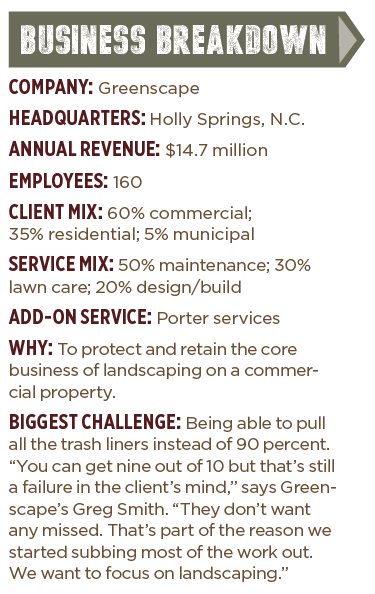 A desire to “dominate the site” led Greenscape, based in Holly Springs, N.C., to begin offering outdoor porter services more than eight years ago. Greenscape’s porter services include a variety of “extras” commercial landscape clients may need, whether it’s emptying dog waste stations for homeowner association (HOA) clients, changing out trash liners at an apartment complex or sweeping parking lots for a retail client. 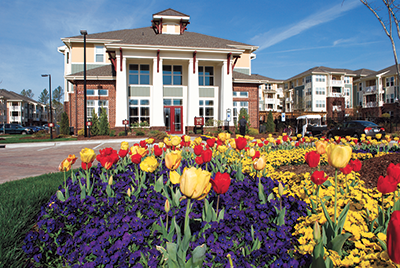 Greg Smith, director of business development, says porter services have been another way he can protect the companies’ clients from competitors who may provide niche services and offer to handle the client’s landscaping, as well. In most cases, Smith subcontracts porter services to specialty vendors, but he remains the main point of contact for the client. Only about 10 percent of Greenscape clients use its porter services, and this work makes up less than 2 percent of the company’s revenue. Smith says it’s a valuable add-on. Property managers prefer having just one point of contact for all their services and are even willing to pay a little more if it means not having to deal with the hassle of contacting multiple vendors, Smith says. Building strong relationships with subcontractors—which Smith calls “strategic partners”—is what makes this system work. The company has worked hard to build relationships with vendors that are in line with Greenscape’s values and principles, Smith says, noting that trust is key. He needs to feel comfortable calling up a vendor who did a poor job and asking them to return to the site to fix it. “After all, as the main point person, it’s Greenscape that’s ultimately responsible for a job poorly done,” Smith adds. One way Greenscape keeps its subs happy and coming back is by paying a fair wage in a timely manner, Smith says. In fact, Smith says it’s not uncommon for other subcontractors to ask, “How do I get to work with Greenscape? I’ve heard good things.” In a time when good subs are hard to come by, Smith says grooming the relationship is more important than ever. Because the work is primarily handled by subcontractors, there was no equipment required to add porter services to the business. The only time landscaping crews will handle porter services themselves is when a property has five trash cans or fewer; then Greenscape takes care of removing the trash liners, Smith says. To price services, Smith works closely with the subcontractors. He’ll have them preview the property and determine the scope before including information in the client’s proposal. In the end, Smith says it’s a win all around. Property managers are happy to have one point of contact, subs are happy to get recurring work and Greenscape is happy to protect its core business. 1 Comment on "Case Study: Benefits of offering porter services"
Very thought provoking. I have mixed feelings rather this would make focus more difficult, or create a niche of sorts in itself. Very interesting to think about for sure.